Flax oil provides many health benefits and may provide relief from hot flashes and breast pain, control cholesterol levels and prevent heart disease. Flax oil is more beneficial than flaxseed for certain health conditions, such as arthritis. Before taking flaxseed products, speak to your doctor. The Natural Standard Research Collaboration cautions the use of flax oil for people with bleeding disorders, diabetes, pregnant women, women with endometriosis and men at risk of prostate cancer. Flax oil, also known as linseed oil, comes from the seeds of the flax plant. The flax plant is believed to have originated in Egypt and today grows throughout the northwestern United States and Canada. Flaxseed oil is available in liquid or softgel and capsule form. It can be healthy for the body as result of its high omega-3 and omega-6 and essential fatty acid alpha-linolenic content. Buying flaxseed oil in encapsulated or soft gel form provides a readily measured dosage for convenience. They are usually available in 500 milligram and 1000 milligram dosages. However, smaller dosages of flaxseed oil in liquid form are required to gain the same omega fatty acid content. One tablespoon of flaxseed oil provides 7 grams of alpha linolenic acid, which would equate to a dozen 1000 milligram gel caps. Another factor to consider is the taste of flaxseed oil. Often capsules are easier to swallow and better tolerated. Flax oil capsules are also more convenient to transport to work or the gym. The ingredients in flaxseed oil softgels and capsules often vary according to the manufacturer. Many flax oils come mixed with other carrier oils, such as evening of primrose oil and pumpkinseed oil. Capsules and soft gels are usually made from gelatin, which is derived from the connective tissue, bones and skin of animals. Flaxseed oil capsules, made with "vegetarian" soft gels from non-animal sources, are available. Flaxseed oil can turn rancid and is easily destroyed by heat, light and oxygen. Flax oil in capsules or soft gels are protected from light and UV radiation, which helps keep the oil stable and minimize free radical formation that could cause the oil to go rancid. Although flax oil is well tolerated and displays few side effects, potential for interactions with dietary supplements and medications can pose a risk. These medications include anticoagulants, such as warfarin and aspirin, blood sugar lowering medications including insulin, cyclosporine, cholesterol-lowering medications and anti-inflammatory drugs. 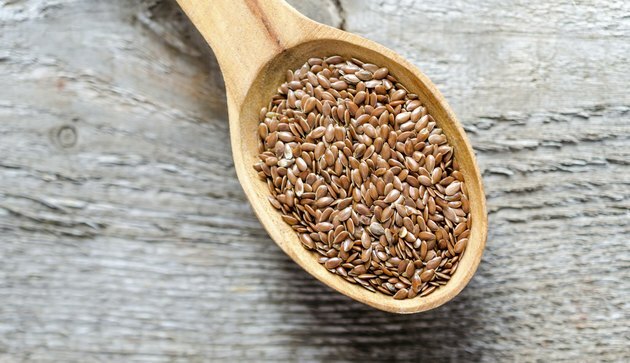 HealthCastle.com: Flaxseed vs. Flaxseed Oil: Who Should Not Take Flaxseed Products?